A CROW VILLAGE, of skin tents, on Salmon River, west of the Rocky Mountains. Extended loan for use by Ambassador Jean Broward Sherlin Gerard, U.S. Embasssy residence, Luxembourg, 1986-1990. 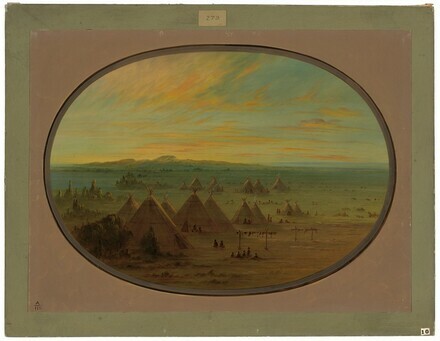 Catlin's 'Indian Gallery': Views of the American West, Museum of Fine Arts, Richmond, Virginia, 1993-1994, no cat.